All vehicle manufacturers produce a maintenance schedule for each vehicle that they build. These maintenance schedules are designed to optimize the safety and dependability of your vehicle. In most cases, if the schedule is adhered to along with periodic inspections it will decrease operating costs and minimize repair bills. Larry's Auto and Truck carries the complete line of Valvoline oil products. Use 10w30 for normal summer driving, 5w30 for winter driving, Maxlife semi-synthetic for high mileage vehicle with special additive to protect seals, Durablend semi synthetic for cold starting and vehicles under 75,000 miles, Synpower full synthetic for new vehicles "the ultimate in engine lubrication". Remove dipstick, wipe it clean. Insert it fully and remove again. If it is low, add oil. To maintain peak performance, change oil every 3,000 miles or 3 months, whichever comes first. Replace oil filter with every oil change. Corroded cables and a weak battery cause starting trouble. Have battery and charging system checked if the engine turns over slowly. 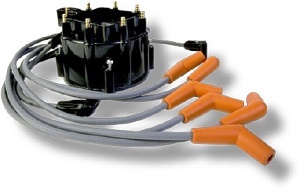 Warm weather puts more demand on your vehicles electrical system than cold weather. It's a good idea to get your battery, alternator, and starter checked before summer vacation travel. Replace worn, glazed or frayed belts. Tighten them when more than ½" of slack can be depressed between the pulleys. Vehicles with spring loaded belt tensioners require no adjustment. Replace bulging, rotten or brittle hoses and tighten clamps. If a hose looks bad, or feels too soft or too hard, it should be replaced. Belts and hoses are one of the main causes of major engine failures due to overheating. Check your belts and hoses every oil change and replace them at 50,000 to 60,000 miles depending on condition. Worn tires are dangerous. Proper inflation, alignment and balance will extend tire life. 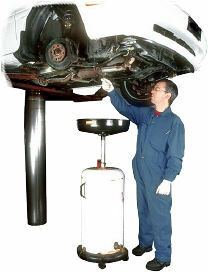 Have your car put on a lift occasionally to check the muffler and other parts of the exhaust system. Have the brake fluid flushed out and new fluid installed every 24 months or 25,000 miles. Brake fluid gets moisture contaminated and losses it's ability to seal and lubricate over time. If the fluid in the brake master cylinder appears dark in color it may be time to replace it. Don't wait for a rainy day to replace worn blades. Road film, poorly adjusted wiper arms, and rubber deterioration are the biggest causes for wiper blade failure. Clean your windshield with a good quality glass cleaner and make sure that the wipers contact the windshield at a 90 degree angle. Test the clearing capabilities of the blade. If streaking still occurs, replacement of the blade is necessary. Did you know that you burn less gas at highway speeds with your windows up and your air conditioner on than you do with your windows down and air conditioner off? Government tests prove it. Reduced air drag with closed windows makes the difference. Scheduled replacement of air, oil gas, fuel, transmission and other filters extend car life and improve performance. With increased fuel costs, it doesn't take long to more than pay for a new air filter. Think about this each time you have you vehicle serviced. You will: increase your gas mileage, increase your horsepower, extend the life of your engine, have easier engine starts, have smoother idles, and provide smoother acceleration. Protect your engine from abrasive particles, which can cause excessive wear and premature engine failure. Improve efficiency by providing the proper amount of air required for combustion. The cooling system in most vehicles should be flushed and new anti-freeze / coolant installed every other year. The pH conditioner in coolant wears out and the system becomes acidic and contaminated which can cause corrosion of internal engine parts, radiators, and heater cores. Most vehicles should have their alignment checked every year. The springs and suspension sag from the weight of the vehicle which changes the alignment angles. This can cause tire wear and handling problems. Postponing needed brake service, in addition to being a safety hazard, can escalate the cost of a brake system overhaul. If your brakes squeak, grind, pulsate, or if the pedal is too low, get them checked right away. Have your brakes inspected every 10,000 to 15,000 miles for wear. Abnormal wear can be caused by poorly adjusted rear brakes. Most rear brakes are adjusted when you apply your parking brake regularly on todays vehicles. Your automatic transmission fluid should be changed every 25,000 miles of normal driving. In most vehicles, transmission fluid gets contaminated much like your engines, oil and seal additives wear out. Check your vehicles maintenance manual for specifics on your vehicle. One very common sight, during the summer months, is seeing a motorist standing on the side of the road, with the hood of the car gaping wide open, and billows of steam issuing from the engine cavity. While this could be the result of a blown radiator, or a worn-out water pump, it has been our experience that it is usually, more commonly, the result of a ruptured radiator hose, or a broken fan belt. Fan belts and hoses do wear out with time but far too many of them wear out prematurely because of one thing...oil. Oil that leaks from the engine, coats the rubber and promotes rapid deterioration. Rubber products, under the hood of a vehicle, that are exposed to oil and the extreme heat of summer driving may be expected to last only 6 to 8 months rather than 3 to 5 years. Not only are the belts and radiator hoses made of rubber but the spark plug wires, vacuum hoses, motor mounts, electrical connectors, and heater hoses are also made of rubber and rubber products. The oil mixed with dirt combine to thoroughly coat the entire engine compartment. This, in turn, insulates the engine and can actually make it run hotter. The main culprit, for oil leaks, is usually the valve cover. In recent years, most auto makers have not used a gasket but, rather, an RTV silicone which is applied to the valve cover, in place of a gasket. The cure for all of this? Repair the oil leak first. Valve cover gaskets that work are made to fit these engines. Then have the engine and engine compartment cleaned. After that simply use a spray or engine cleaner and rinse 2 to 3 times per year. It could save you hundreds of dollars and keep you from being that person stalled on the side of the roadway. In simple terms goes like this. There are basically two types of engines. One type is known as a non-interference, this means if the timing belt breaks the engine is able to free wheel without damaging the internal parts. The other type is known as the interference engine, this means if the timing belts breaks the piston can make contact with the valves, resulting in severe damage. Either way, it is important to maintain a good timing belt. Most cars recommend replacing the belt at every 60,000 or 90,000 miles depending on the vehicle manufacturer.